Carlos Gonsalves, from the little hilly town of Mapusa, in Goa, has drummed his way into recognition, as one of the premier percussionists in the region. A humble soft-spoken percussionist, Carlos lets his drums do the talking, hence the name of the news article published in a local Goan newspaper 3 years ago that led to the title of his percussion filled DVD and his motto from then on - Talking Drums. Not just a vague statement, but a statement of intent. After jamming with some of the best musicians in Goa and India, even 'busking' in Ireland, Carlos is all set to move onto bigger platforms. 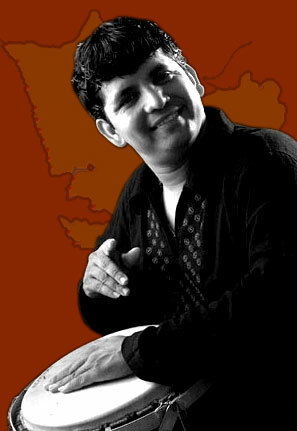 His music, his sound, his feel; it's all derived from his experiences, his inspirations and his life. All of that is unraveled when you watch him play and listen to him gently, and sometimes with pure passion, slap his drums into life. Carlos Gonsalves has been interviewed on TV, Radio and numerous times in print. He has also held many workshops in Goa, at various educational institutions, where he has encouraged young aspirants to seek their own path of musical enlightenment. One of the highlights in his career was when he was part of the Tata Indicom ad campaign with Ajay Devgan and Kajol. He's constantly plugged in to his favourite music, ranging from well-known Indian acts like Sivamani and Trilok Gurtu, to Steve Gadd, Alex Acuna and Gregg Bissonette amongst others. And while he does moonlight in Goa with various bands - rock, jazz and blues - as a drummer, his own set up is a solo effort, just Carlos and his talking drums.